Chronic diseases of the 21st Century — heart disease, diabetes, obesity, asthma and depression — can be impacted by surrounding environments. There is a connection, for example, between the fact that the urban sprawl we live with makes no room for sidewalks or bike paths and the fact that we are an overweight, heart disease-ridden society. The policy, systems, and environmental work of Live Well should eventually help move Crawford County to a better placement in the health and wellness indicators. Administer and implement the Healthy Community Initiative Grant from the Kansas Health Foundation. Establish an Active Transportation Board for Crawford County. Develop an Active Transportation Master Plan for Crawford County. Administer and implement an Eat Well Grant. Live Well Crawford County began with the assistance of the Kansas Health Foundation in order to promote healthy lifestyle choices through education, motivation, and support for all generations. Live Well has continued to grow and has established four task forces: Live Active, Eat Well, Breathe Well and Age Well. These task forces are targeted to improve the life of Crawford County citizens and help to prevent chronic diseases. Community Foundation of Southeast of Kansas is awarded a Nutrition and Physical Activity (NAPA) Grant from the Kansas Health Foundation. Focus: Form a health coalition to implement nutrition and physical activity improvements in Crawford County. 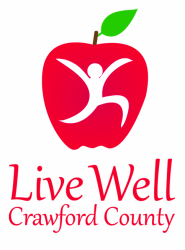 Live Well Crawford County (LWCC) is established. LWCC hosts Health & Wellness Teacher In-service and Public Community Event. Collaborated with school superintendents, 700+ school staff and 20+ citizens attended. LWCC hosts Health & Wellness Learning Sessions at county schools. Held 60 after-school wellness sessions in school buildings such as strength building, eating right, Zumba, street management, gardening, aerobics, golf, tennis and biking. LWCC hosts Mark Fenton, a national public health planning and transportation consultant. Crawford County Commission Board approves and establishes a Food Policy Council. Partnership with Crawford County Health Department, Live Well Crawford, Community Health Center of SE Kansas, SE Kansas Action Program and K-State Extension. LWCC establishes the Live Active Task Force and Eat Well Task Force. City of Pittsburg passes an ordinance to establish the Active Transportation Advisory Board. LWCC establishes the Breathe Well Task Force and Age Well Task Force. City of Girard passes an ordinance to establish the Active Transportation Advisory Board. City of Pittsburg adopts the Active Transportation Master Plan, prepared by PedNet. New Venture Advisors conducts a Community Food Assessment for Crawford County. Focus: Evaluated the local food system, healthy eating behaviors, healthy and economic development. LWCC is named 2015 Kansas Health Championship Organization by the Governor’s Council on Fitness. LWCC is awarded funds from the Girard Area Community Foundation for trail activities on the Born Learning Trail. Eat Well Task Force is awarded a $40,000 Food Policy Implementation Grant from the Kansas Health Foundation. Focus: Worksite wellness and increasing locally grown food for local consumption. City of Girard adopts the Active Transportation Master Plan, prepared by PedNet.